When it comes to eating animals, most people rely on the standard fare of beef, pork, chicken or fish. 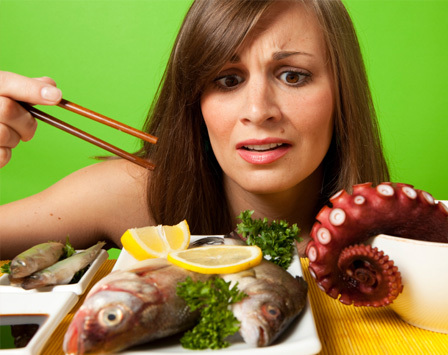 However, in many places around the world, people eat a variety of animals that would shock most Americans. Some are endangered, some are alive and some are just downright dangerous. Sannakji is a Korean dish made from nakji, an octopus. Eating octopus is not all that uncommon, especially in Asian countries, and you can likely find it on the menu at many Asian restaurants in the United States. However, this octopus dish is served raw — and by raw, we mean the octopus is still alive. The octopus is served whole or cut into small pieces and seasoned with sesame oil. Eat quickly or you might lose your lunch. Despite that fact that elephants are an endangered species, people still hunt them for their meat. Most people are aware that poachers hunt elephants for their tusks but the meat is also considered a prized delicacy. An elephant can produce about a half-ton of meat, making it a profitable business for poachers who smoke and sell the meat. The practice is most common in Africa. Gorillas get a tough break all around. Their habitats are being destroyed at rapid rates, the areas they live in often have limited law enforcement and people are eating them. Some scientists think the gorilla could be extinct within the next 10 years unless major changes are made. They are caught right in the middle of the bush-meat trade, and their meat is a big business in some areas. In America, How to Eat Fried Worms is nothing more than a cute book for children, but in Korea it might as well be a cookbook. It is common to eat battered and fried silkworms, boiled silkworms or worm kabobs. Supposedly they have a distinct smell and a bitter taste. Upon biting them, they pop and juices come out. Sounds delicious, no? We consume a variety of fish and seafood, so it really isn’t all that odd that people eat puffer fish — unless you know that eating just one could kill you. Puffer fish are thought to be one of the most poisonous vertebrates in the world. Chefs use a very precise method for preparing the fish so that it is not toxic but sometimes the preparation fails. Eating the fish can cause numbness, paralysis of some muscles including the diaphragm, light-headedness and rapid heart rate, to name a few effects. The poisonous fish is often consumed by accident as it is generally cheaper than other fish. Perhaps what doesn’t kill you makes you stronger? In many places where meat is very expensive, getting pork or beef is out of the question. That’s where rats come in. It isn’t uncommon in some Asian countries to serve whole battered rat. Recently Congress lifted the ban on providing funding for horsemeat inspections in the United States. That means horse steak could make an appearance on dinner plates in the near future. Many Americans are strongly opposed to consuming this majestic animal, which they view as a pet, but horse meat is fairly common in Canada and Europe. In some areas, turtles are protected but in others they are fair game. In addition, sea turtles are often illegally poached and consumed. While turtles are a more common menu item in Asian countries, you can easily find recipes for turtle soup on websites like The Food Network. People often joke that dodgy restaurants are likely serving dog, but the reality is that people actually do eat them. In most countries it’s most common to find the family dog curled up on the couch, perhaps with its very own knitted sweater. In other areas where protein sources are scarce, dog makes an excellent dinner. Why? It is much larger than a rat. It sounds like a sugar alternative or some other trendy health food product, but it is actually a rodent that looks like a cross between a rat and a beaver. More commonly called a river rat, nutria are major pests that destroy vegetation, erode coastlines and wreak havoc for residents, which is precisely the reason Louisiana actually tried to talk people into trapping and consuming the critters. We hear nutria sausage is delicious.